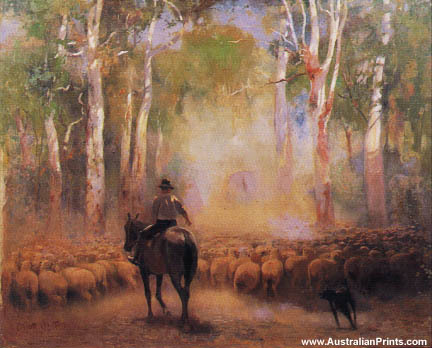 Walter Withers was an Australian landscape artist and a member of the Heidelberg School of Australian impressionists. Walter Herbert Withers (22 October 1854 — 13 October 1914) was an Australian landscape artist and a member of the Heidelberg School of Australian impressionists. 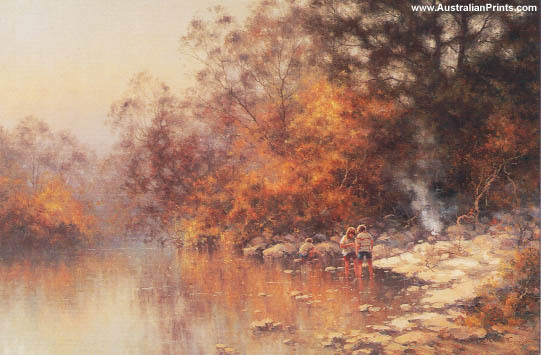 Painter, lithographer and teacher, Walter Withers was arguably the most widely experienced member of the Heidelberg School of Australian landscape artists. He was born in England and studied painting in London at the Royal Academy and South Kensington Schools. Upon arriving in Melbourne in 1883 he spent 18 months as a swagman doing odd jobs. From 1884 to 1887 he worked as a draughtsman for a firm of litho printers, at the same time attending life drawing classes at the National Gallery of Victoria School. It was probably in Europe, having returned to London to marry in 1887, that he acquired his interest in Impressionism and the work of James Whistler. 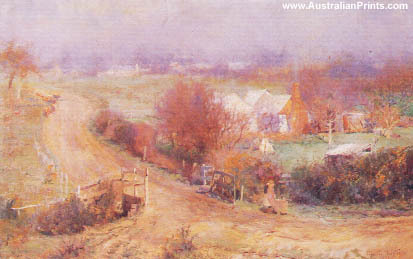 Withers returned to Melbourne in 1889 to work as an illustrator, then joined the Heidelberg School where he was nicknamed ‘The Colonel’, presumably for his orderly ways. He was awarded the Wynne Prize for landscape paintings in 1897 and 1900 and settled in Eltham, Victoria in 1902. Artist information page for Walter Withers. This article uses material from the Wikipedia article Walter Withers, which is released under the Creative Commons Attribution-Share-Alike License 3.0. Artist information page for Ramon Ward-Thompson. Ramon Ward-Thompson was born at Masterton, New Zealand in 1941 and showed an early flair for drawing. In 1960 he emigrated to Sydney, Australia. During a visit to the galleries of Europe, he found himself drawn, in particular, to the paintings of the French impressionists. On returning to Australia from Europe, he decided to try making a living as a painter and took a keen interest in the work of the Australian impressionists of the Heidelberg School. Both influences, French and Australian, made an impression on his work. Indeed, many commentators have seen Ward-Thompson’s work as representing a kind of latter day extension of the Heidelberg School of Australian art. His other influences include the bright colours of Rubury Bennett, the subtleties of Elioth Gruner and the composition of Percy Lindsay. Ward-Thompson is, above all, a romantic painter. 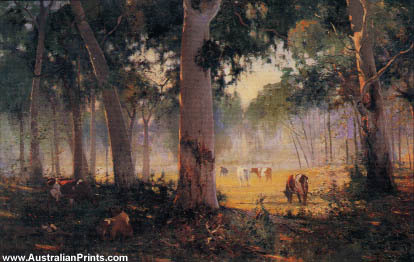 Jane Sutherland was an Australian landscape painter who was part of the pioneering plein-air movement in Australia and a member of the Heidelberg School. 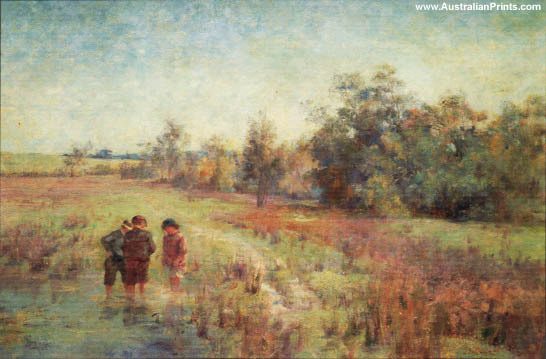 Jane Sutherland (26 December 1853 – 25 July 1928) was an Australian landscape painter who was part of the pioneering plein-air movement in Australia, and a member of the Heidelberg School. Her advocacy to advance the professional standing of female artists during the late nineteenth century was also a notable achievement. Daughter of George Sutherland (1829-1885), Jane Sutherland was a painter and engraver from a family of diverse artistic talents. She was born in Scotland and arrived in Australia in 1864. When she was 26 she was accepted by the prestigious National Gallery School which she attended until 1885. 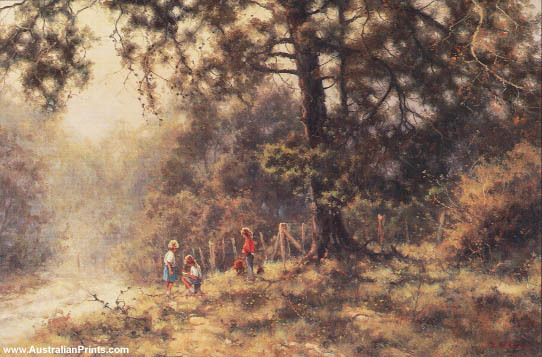 It was here that she struck up friendships with McCubbin and Roberts. In 1884 she was elected a member of the almost exclusively male Buonarotte Society, a group of young radical artists. It was about this time that she set up and shared a studio with fellow student Clara Southern in the Grosvenor Chambers where Roberts kept a studio. Sutherland was one of a group of voting painters who escaped the city and the classical influence of the art school by sketching in Melbourne’s outer suburbs, Templestowe and Eaglemont. This group became known as the Heidelberg School. Artist information page for Jane Sutherland. This article uses material from the Wikipedia article Jane Sutherland, which is released under the Creative Commons Attribution-Share-Alike License 3.0.